This is a field seeded with red clover, meadow fescue and lotier. Lotier is the French name for Birdsfoot trefoil and works rather well because it is easier for me to say and is close to the Latin name of Lotus Corniculatus. It grows wild in my pastures but here I seeded it. Lotier is something of an old-school plant which few people seed but it has the nice property that it doesn’t cause bloat. This paddock is called California because it was the biggest vineyard on the farm. It is missing a lot of soil fertility becuase of its decades as a vineyard and the soil structure is poor, but for some reason the legumes took off here in late winter. I’m always impressed with your forage, and most of the year a little envious, as it seems your climate is more moderate than here in the midwest USA. I think our winters are milder in general but we can still get a week of below freezing weather. The biggest winter issue is the rain on our clay soils. If you leave the cows in one place too long you get a mud bath. Summer is just hot and dry and can drought for months at a time when everything stops growing. Fall growth can be feeble, too. 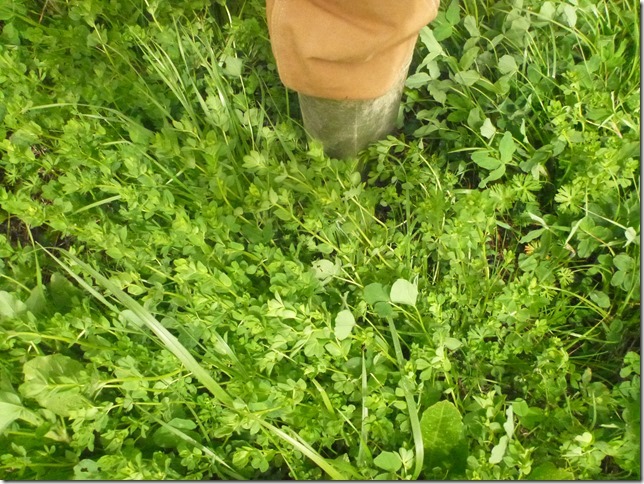 I’m still learning how this climate and soil works and how to manage forage in it. Our pastures don’t look anything like yours, but I’m happy to say that I recognize the lotier because we have it, too! I didn’t know it was a legume or that it didn’t cause bloat–always learning something from you! Thanks! This field has been idle since the end of summer and so has built up a fair bit of forage. I can’t say that it was any strategy, it was just too soft to graze over our wet winter. The soil here doesn’t have good structure yet. I picked red clover and lotier because they were the two plants that seemed to take off in September before anything else, but I didn’t expect them to do well in late winter too. 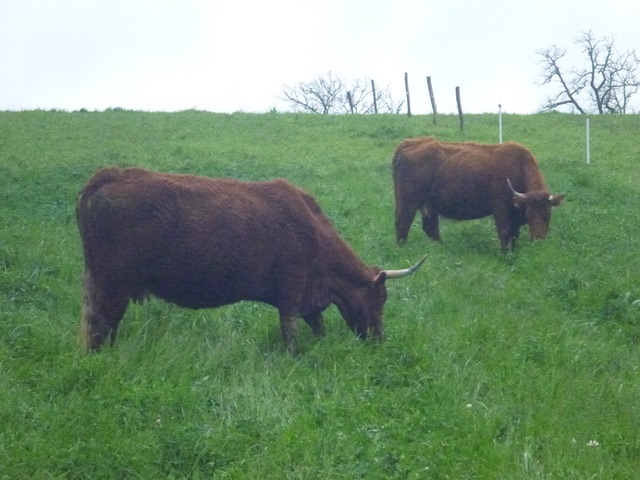 They both do well wild on our farm, especially the red clover. I have some older pastures that are covered in red clover.